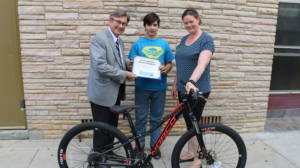 Joe Barberi and Allison Quast-Lents, owner of Motorless Motion, present Philip Smith, 13, with his mountain bike in downtown Mt. Pleasant. 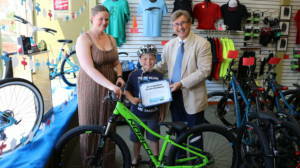 Allison Quast-Lents, owner of Motorless Motion, and Joe Barberi award Peyton Duncan, 8, his new mountain bike in downtown Mt. Pleasant. 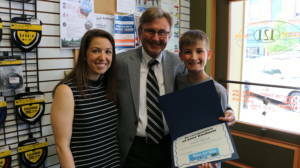 Joe Barberi and Allison Quast-Lents present Adyn Schwartz, 13, with his certificate and mountain bike at Motorless Motion in downtown Mt. Pleasant. 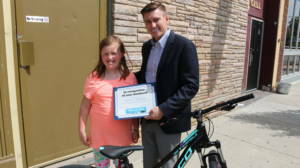 Dave Barberi presents Genavieve Huntoon, 8, with her certificate and mountain bike at Motorless Motion in downtown Mt. Pleasant. 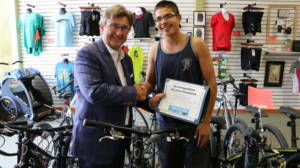 Joe Barberi gives Vincio Fernandez, 11, his Bikes for Kids certificate at Motorless Motion in downtown Mt. Pleasant. 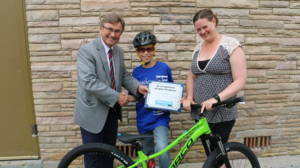 Drew Novak, 11, receives his Bikes for Kids certificate from Joe Barberi and one of the teachers who nominated him to win a bike, Rachel Jaksa. 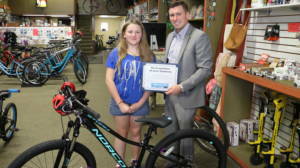 Dave Barberi presents Faith Schuch, 14, with her Bikes for Kids certificate at Motorless Motion in downtown Mt. Pleasant. 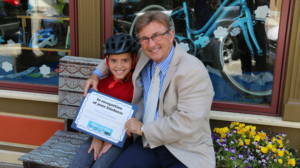 Brock Binder, 10, gets his Bikes for Kids certificate from Dave Barberi in downtown Mt. Pleasant. 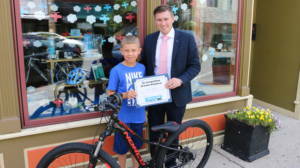 Joe Barberi presents Jarrad Johnson, 14, with his Bikes for Kids certificate at Motorless Motion in downtown Mt. Pleasant. 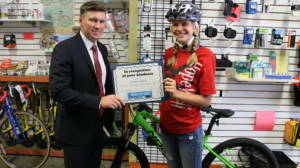 Elizebeth Tarrant, 12, gets her Bikes for Kids certificate from Attorney Dave Barberi at Motorless Motion in downtown Mt. Pleasant.